So at this point, you guys should know we love the Boardwalk area and will basically do anything we can to stay there. Unfortunately, when peak times hit, like Spring break or Christmas, the resorts on the Boardwalk(and everywhere else on Disney property) can really skyrocket. We are talking, you’d better sit down when you see these prices, kind of high. 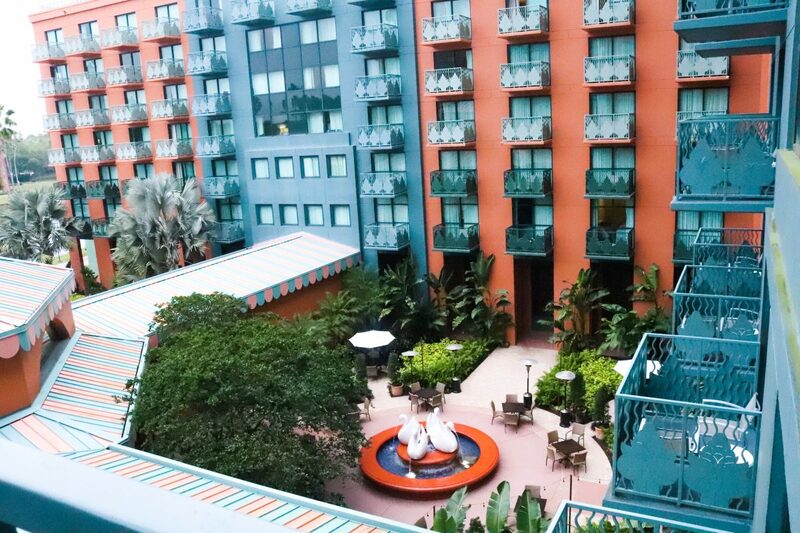 We’ve talked about how we love using a third party to book a great deal on Walt Disney World property. 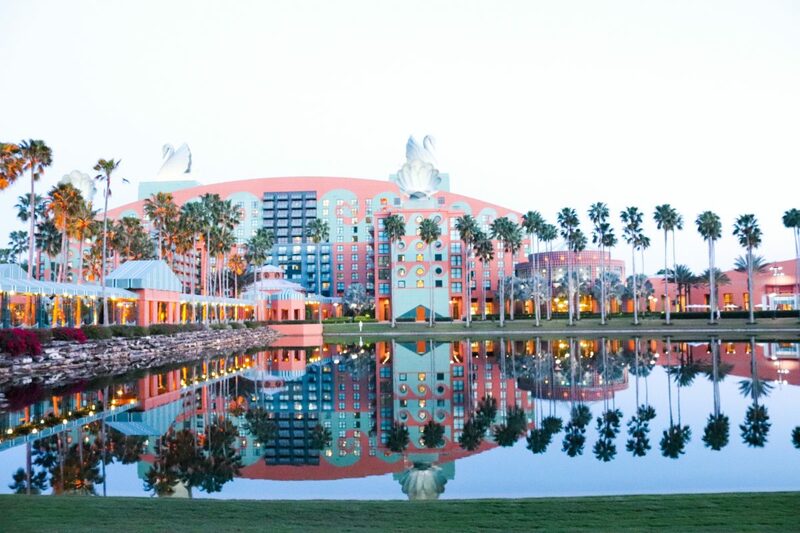 One of the best deals we usually see on a third party site is for the Disney Swan and Dolphin hotels. 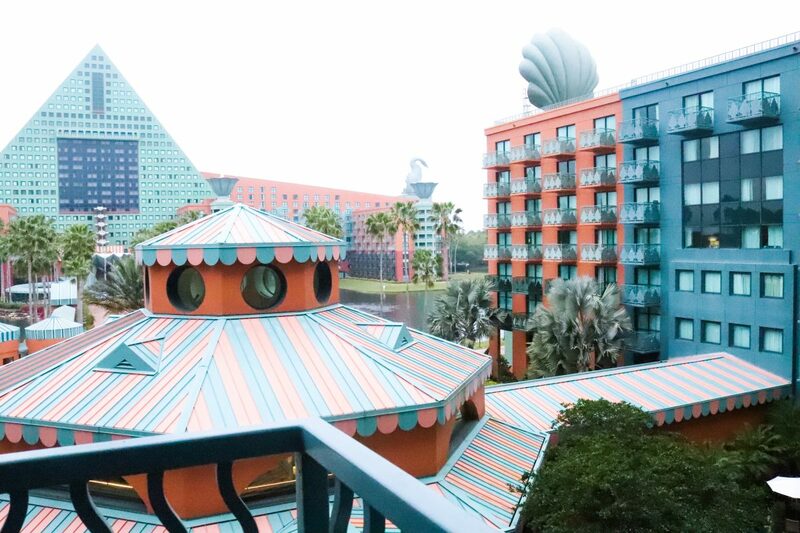 We stayed at the WDW Dolphin before and absolutely loved it, so we were excited to find a great deal during Spring Break at the Walt Disney World Swan to see how it compares! For starters, the Walt Disney World Swan isn’t managed by Walt Disney World. It’s managed by Westin and as a result you can collect/redeem Mariott Bonvoy points at this resort. 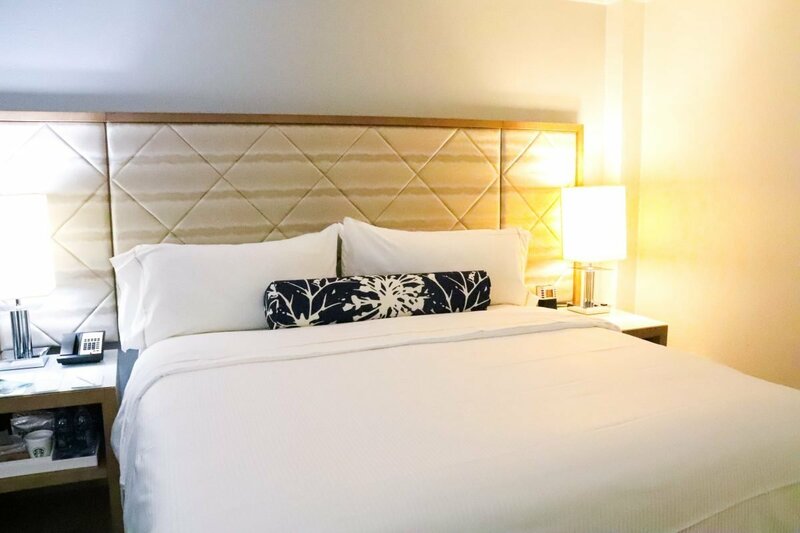 This is a nice perk if you’re a frequent traveler because the Mariott Bonvoy Points program is one of the very best in our opinion and who doesn’t want free nights at Walt Disney World?! We also used our hotels.com hack on this trip and were able to save a ton, all while earning points towards both hotels.com and Marriott Bonvoy. Not a bad deal. If you ask us, the location of the boardwalk resorts can’t be beat. 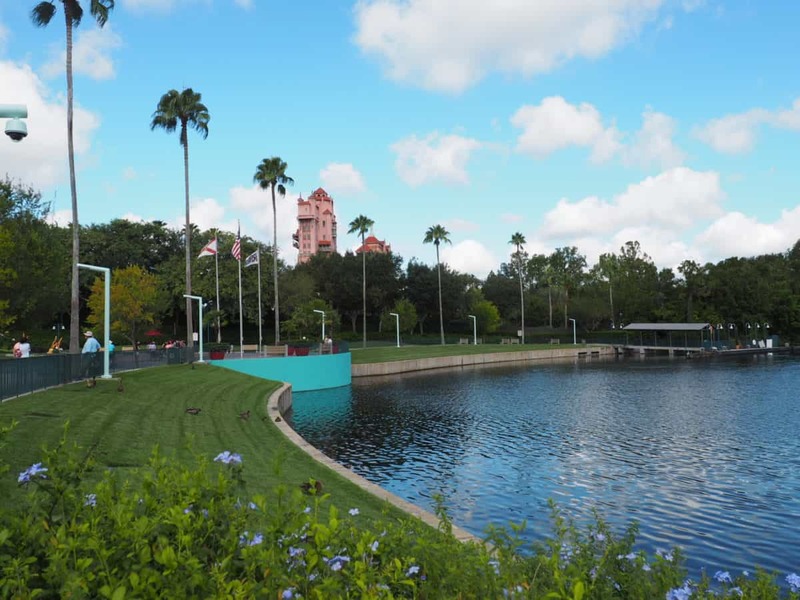 (Sorry monorail resort lovers, we prefer the Boardwalk area) Having the convenience of being able to walk to two different Parks saves us so much time when we are traveling to Disney. 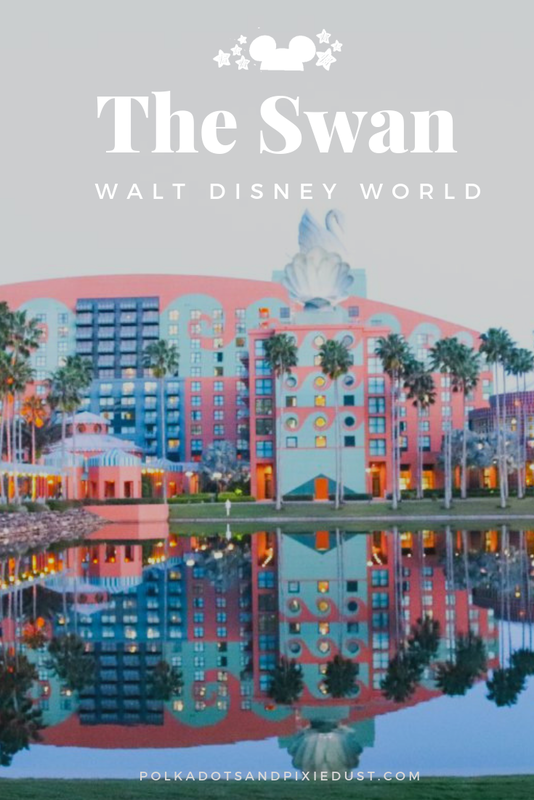 Being about a 10 minute walk from Epcot and 20-ish minute walk from Hollywood Studios, the Swan is really the perfect location. And let’s be real here, who doesn’t love the Boardwalk? It’s classic, it’s beautiful and best of all, it’s usually not too crowded! We were very lucky to be upgraded to a deluxe king balcony room at the Swan. We had a view of the WDW Dolphin and beautiful swan fountains below. Our balcony was perfect for morning coffee or late night relaxing. The view was beautiful and the sounds of the fountains really drowned out most of the noise below. The room itself was pretty standard to most rooms in that area in terms of size. We had a king bed, small sleeper sofa, desk and a TV. 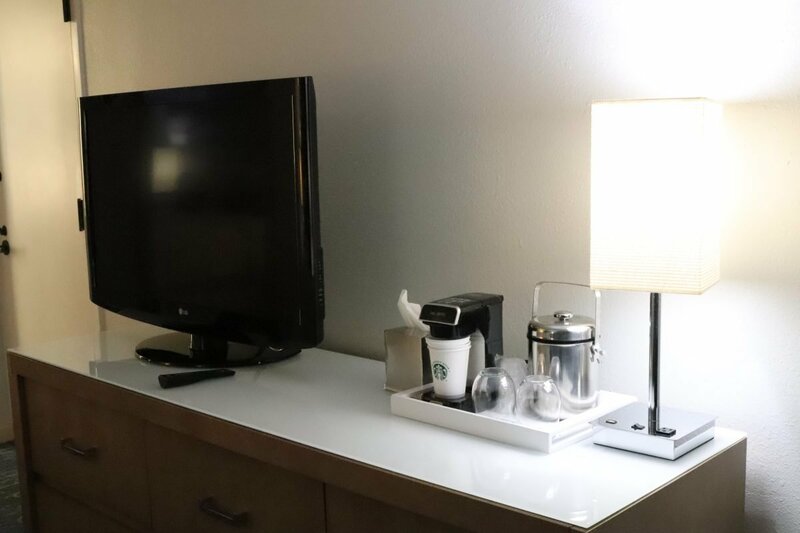 The room also comes with a coffee maker with Starbucks coffee as well as a mini-fridge. 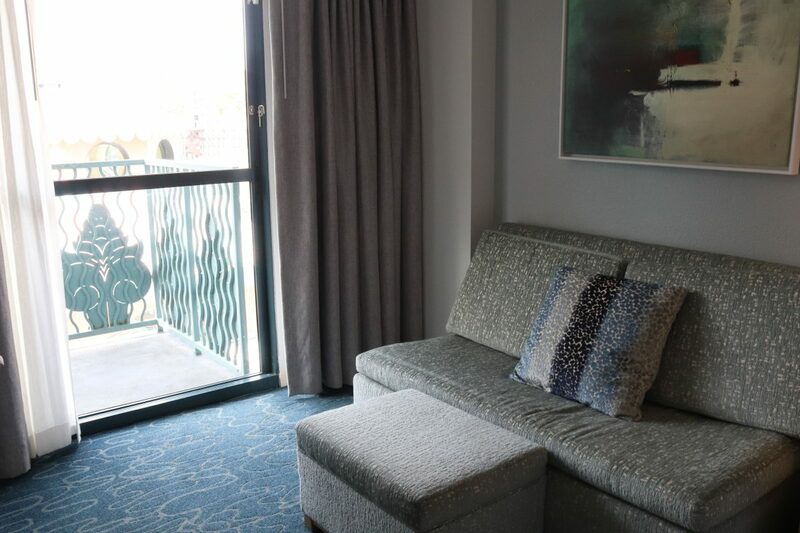 Again, while the Walt Disney World Swan is actually on Disney property, it is managed by Westin, meaning that they have their signature Heavenly beds in these rooms, and well, they are quite heavenly. 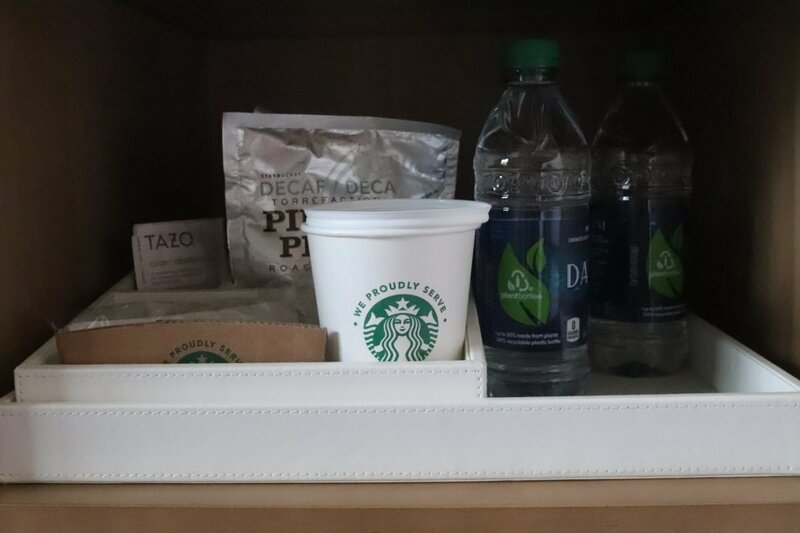 The rooms come stocked with water bottles, coffee, hot tea bags and standard toiletries. The bathrooms is separated from the vanity area which makes getting ready in the morning a breeze. The mirrors are backlit and provide excellent lighting, which we really appreciated. 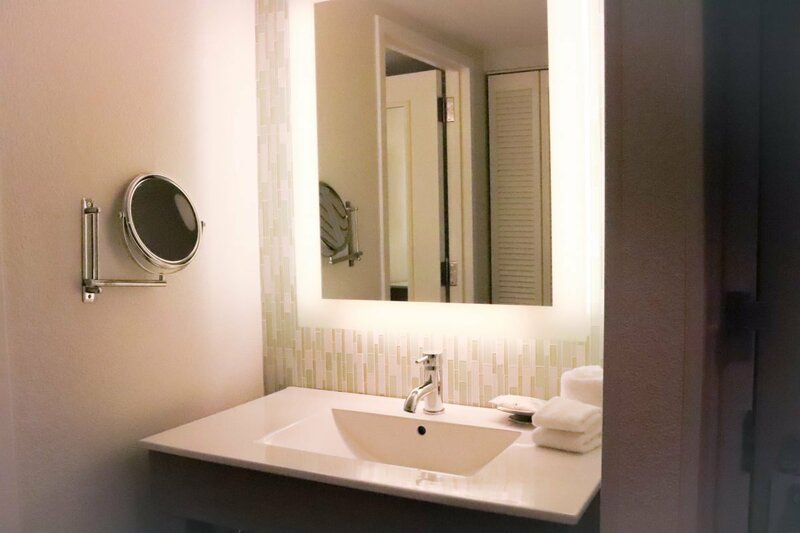 If you’re looking for Amenities, there’s no shortage of them at the Swan. Not only do they offer the classic WDW benefits, like 60 day FastPass selection, extra magic hours and Disney transportation(see more below), they also have their own set of amenities as well! Bell Services, National and Alamo Car Rental desk, coin operated laundry, shops, dining options, concierge services and much more are all available here. For a full list, click here. There is also a health club complete with Peloton bikes, fitness equipment, a wellness concierge and much more, so if you’re looking to work off whatever you were eating around the world, you’re in luck! 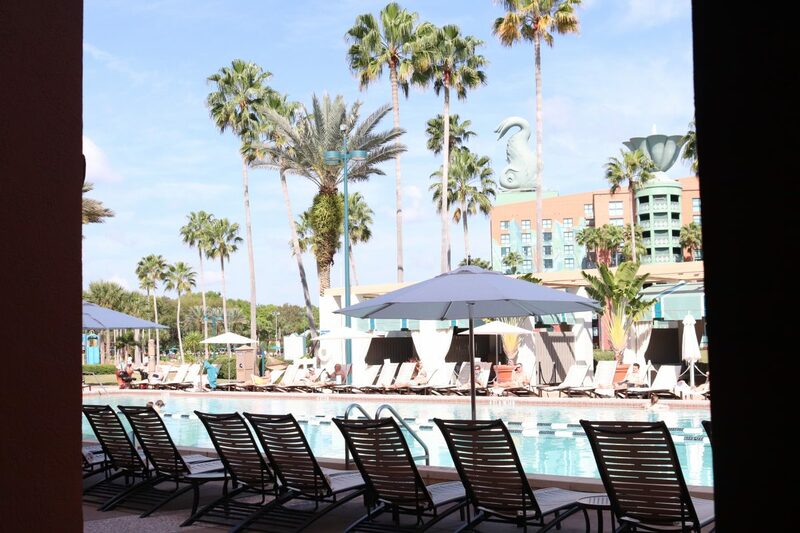 The Swan and Dolphin share perks, so you can use any of the pools at either resort, as well as the beautiful beach over at The Dolphin. You can also rent watercraft at the Swan and Dolphin, play beach volleyball or bring your kiddos to the beach playground. 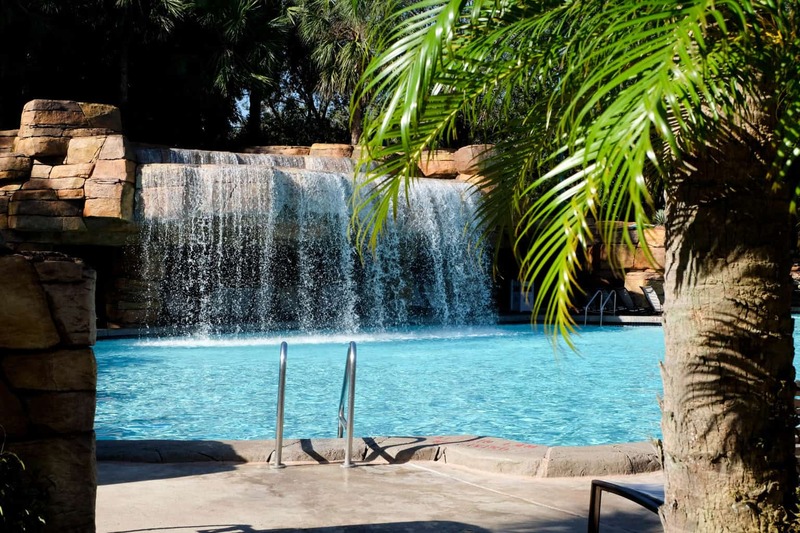 There’s so much to do at this resort! There are quite a few options for dining here. The Swan itself has character dining in the evening at Garden Grove or you can forgo the characters and get breakfast and lunch daily here. The characters also make their appearance on the weekends for breakfast, so if you’re looking for a character meal without having to get through bag check lines at the Parks, they’ve got you covered. Java Bar is also located near the entrance and here you can grab juices, hot cocoa, espresso and pastries for a quick morning bite, although we prefer the wider selection offered over at Fuel at the Dolphin. 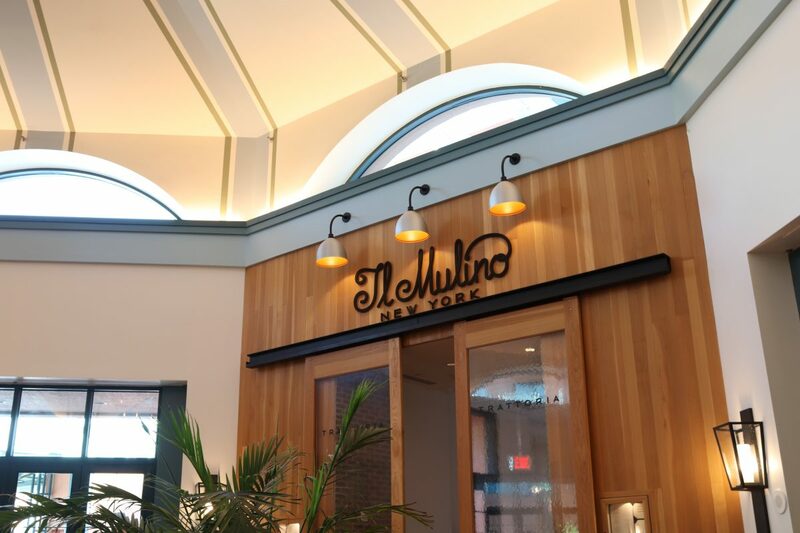 For a more upscale experience, Kimonos Lounge and IL Mulino are also on site at the Swan. 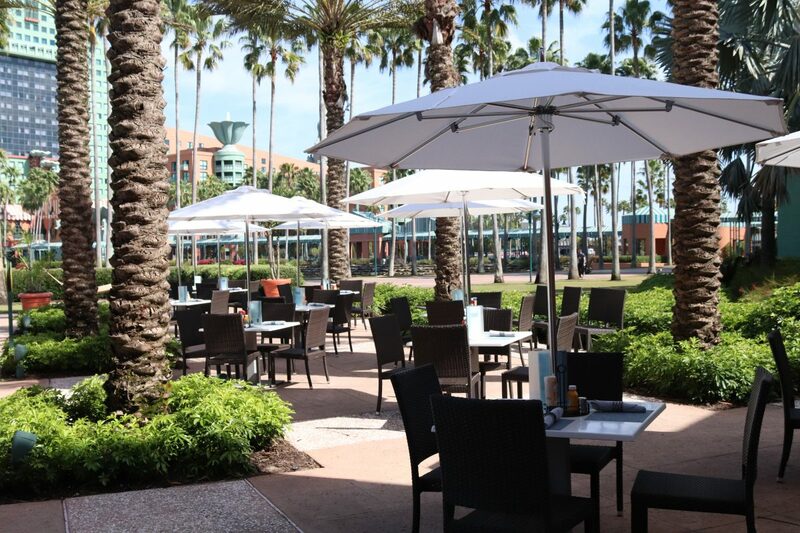 To see all restaurants available at The Swan and Dolphin, click here. Transportation is easy at the Swan. 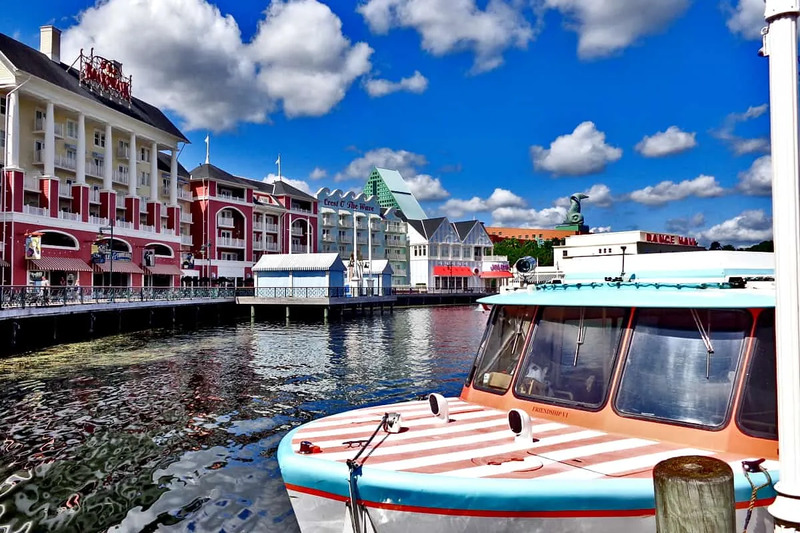 We love that you can walk to Epcot and Hollywood Studios, but if walking isn’t your thing, you can always take the Friendship Ferry to either Park. 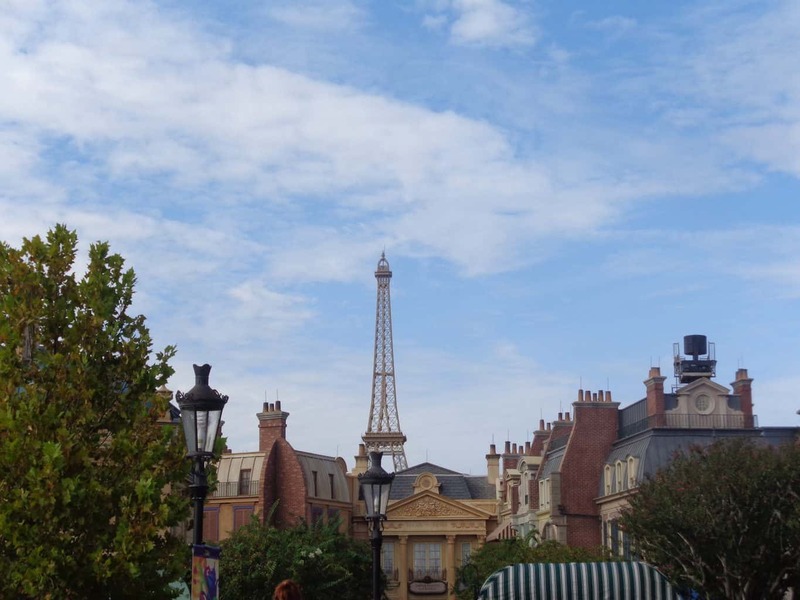 Walking to Epcot will take you to the back entrance of Epcot, the International Gateway, between UK and France in the world showcase. 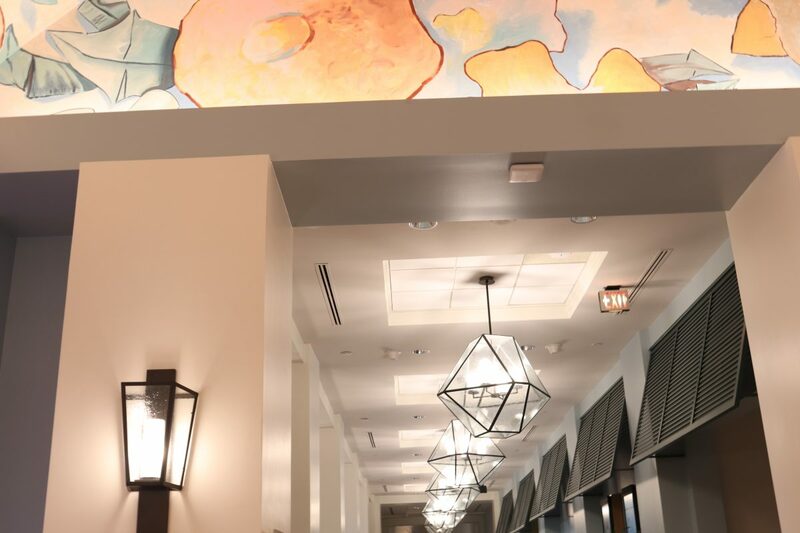 It’s the perfect place to start your day at Les Halles Boulangerie and Patisserie for breakfast. 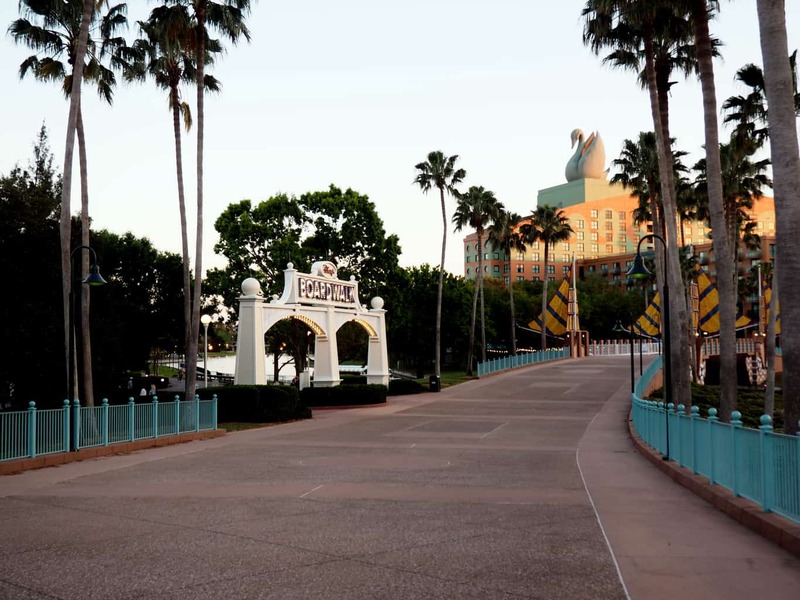 And if you want to walk to Hollywood Studios, this post can tell you how to get there. Buses go from the Swan to both Animal Kingdom and Magic Kingdom. Or, you can get into Epcot and take the monorail to the TTC, then over to Magic Kingdom if you prefer to skip out on the Disney buses. 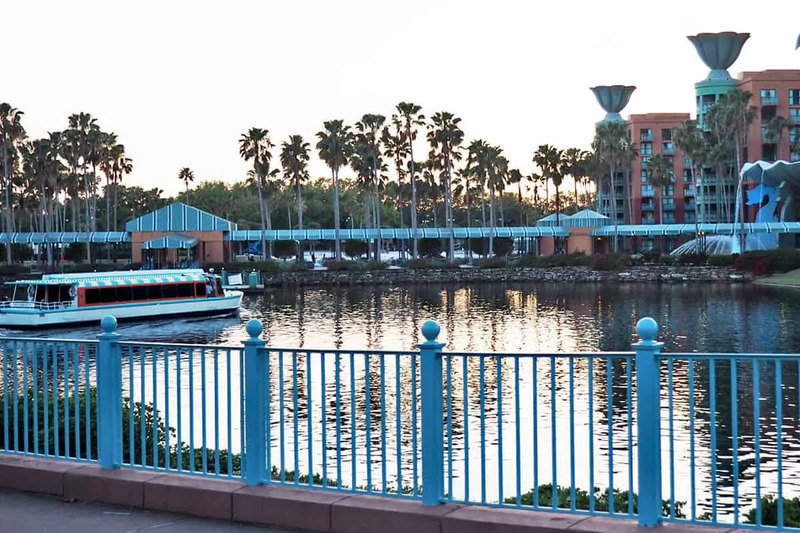 Disney buses also take you to both water parks and Disney Springs from the Swan, and if you’re really not a fan of buses, Minnie Vans, Uber and Lyft all travel to this resort as well! One important thing to note, there is no magical express here. So if you aren’t renting a car, you will have to find your own transportation to/from the airport if you’re flying in. Uber and Lyft generally cost about $30 each way to and from MCO, but those prices can vary depending on time of day. 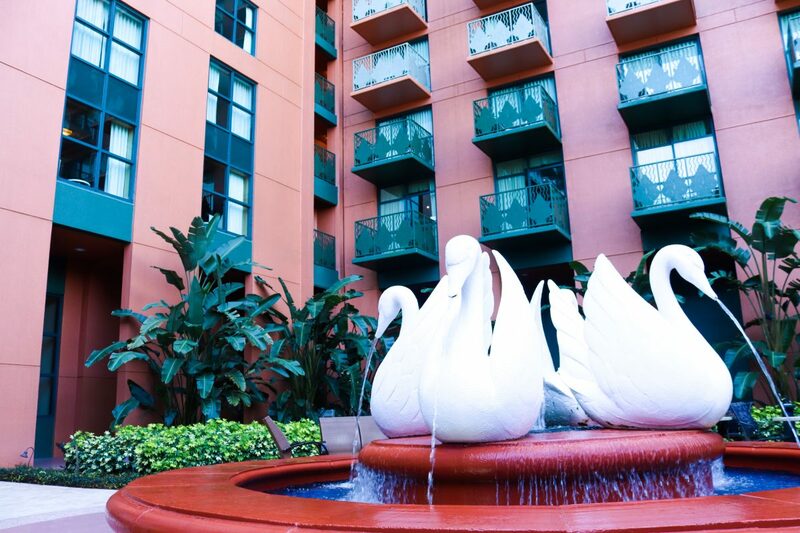 And yes, the Swan does have bell services if you get to the resort and your room isn’t ready, or if you want to spend a day at the Parks on your last day before you fly out. One of the programs we loved at the Swan is their “Go Green” program. 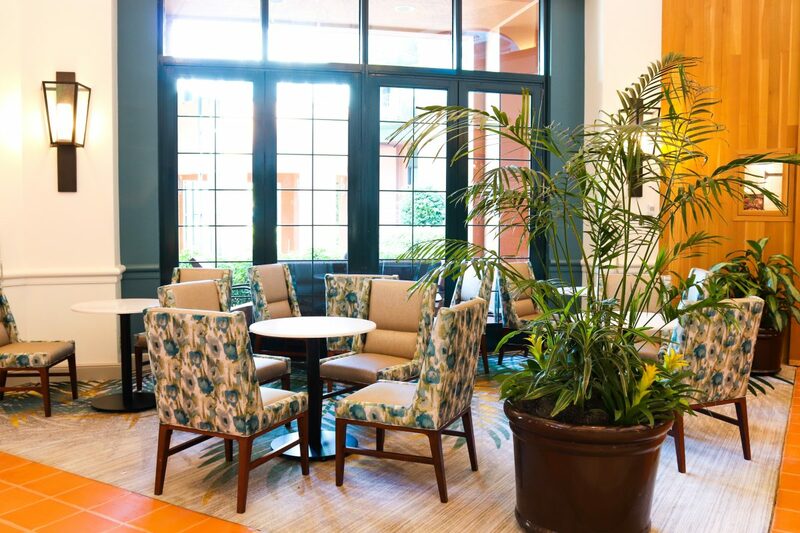 If you opt to forgo housekeeping services, they will give you a $5 voucher per day for use at any of their restaurants on site or an extra 500 points per day for your Mariott Bonvoy account. Using this program is easy and we love helping out the environment in any way we can, so its a win win for us. Housekeeping will continue to bring you new water bottles, coffee and toiletries each day and will take your trash if you leave it for them, but your room will generally not be serviced, meaning no one will make your bed, or basically do any of the basic housekeeping you would expect. This is totally optional and could be challenging for large parties or longer stays, but for short stays we found it to be a great perk! As much as we love the Walt Disney Swan, we have to point out the cons here. The biggest con(to us anyway) is the lack of the Magical Express. As much as it’s not really that big of a deal, it’s definitely something that should be noted because it can pose some inconveniences. Aside from having to pay for an Uber or Lyft from the airport if you’re flying in, you will also have to be responsible for your own luggage. 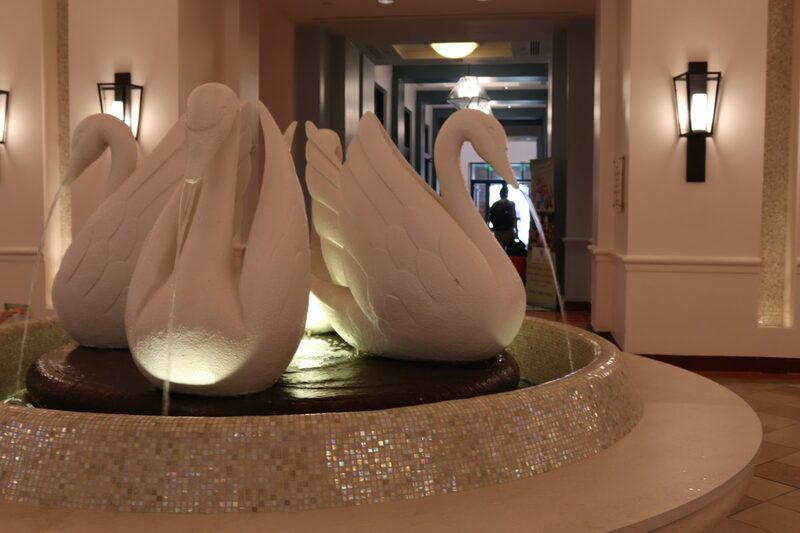 The Swan has bell services so you can leave your luggage with them on the arrival or departure day if needed, but it is definitely not as magical as dropping off your luggage and having it appear where you need it, whether upon arrival or departure. First world problems, right?! Yea we get it. The other thing to note that some people definitely may consider a con is the lack of theming. There is really no Disney presence at the Disney Swan and feel is really just a low key, soft atmosphere. For some people this will definitely be a con; for others, it may be a nice break from being submersed in Disney all day. We’ll let you decide. 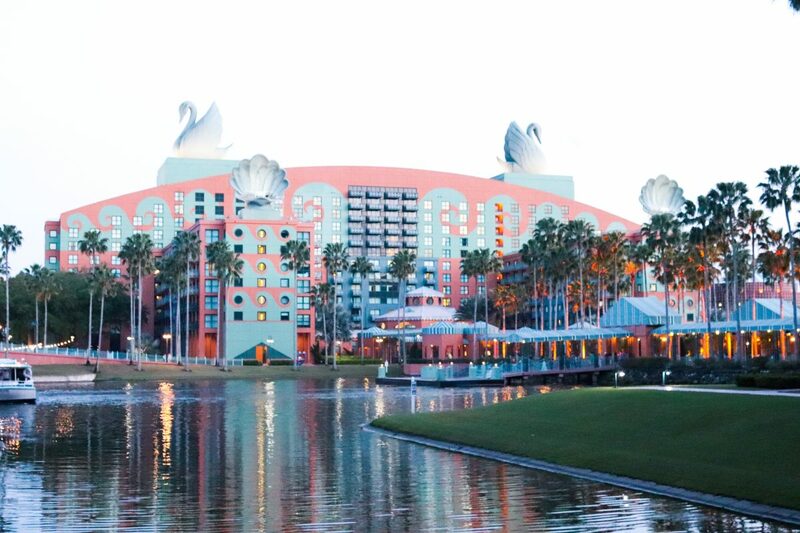 Lastly, the other thing to note is that a lot of conventions and conferences are held at both The Swan and the Dolphin, which definitely gives it a little bit more of a “business” feel and less of a vacation feel. For us, it didn’t really make a difference, but just be aware that while you are all decked out in Minnie mouse ears and character tees, you may be surrounded by professionals in suits and pencil skirts. 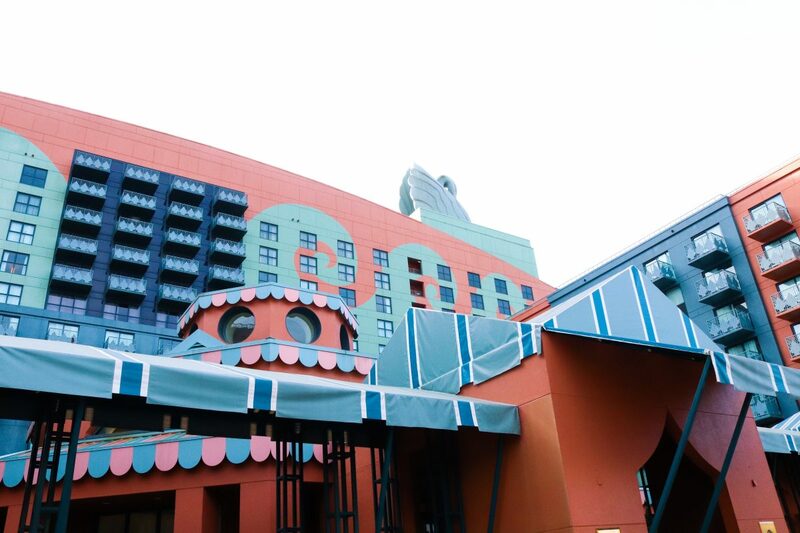 Overall, we love staying at the Walt Disney World Swan and Dolphin and highly recommend either of them. Have you stayed there? What did you think? Let us know!